Take a trip to the ancient ruins of the Aztec cities to uncover ancient relics of a once great civilization. Click here to play! Find as many relics as possible by spinning these reels and you’ll bring in plenty in cash rewards. As you search these deserted cities, watch out for the gemmed totems and tiles. These ruins are invaluable. The purple totem holds the top payout of the game, grabbing up to 2,000 times your line bet if you can spin two or more across an active payline. Next up is the orange wolf totem. This symbolic statue will bring in up to 1,500 times your line bet. The yellow totem will bring in up to 1,000 times. The multi colored tiles will bring in payouts with each one valued between 50 and 200 times your line bet. 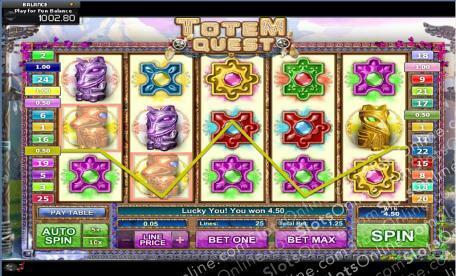 To help you in your search for these valuable items, Totem Quest has a few special symbols. This includes a free spins icon. Spin three of them anywhere on the board to trigger up to 15 free spins. There are also three separate bonus games, each one triggered by the golden pot, the black bomb, or the Totem Quest icon. All three are an excellent way to pick up some very substantial wins So, spin the reels to comb the ancient Aztec ruins for a chance to uncover untold amounts of treasures. The free spins totem is a scatter. Spin three or more anywhere on the board and it will trigger up to 15 free spins. There are three bonus games in this 5 reel slot. Spin three or more of the Indian bag, bomb, or Totem Quest logo symbols anywhere on an active payline to trigger one of three bonus games. During these games you will have to perform a task, such as catching flying tiles, to reveal your bonus prize.